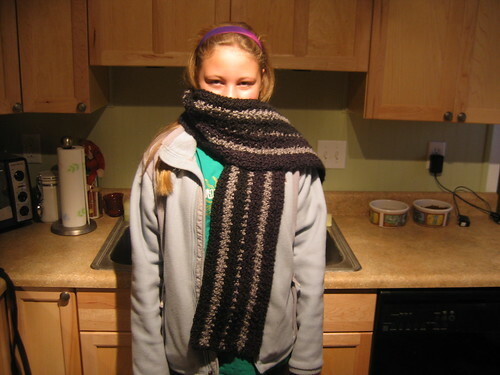 The scarf pictured (modeled EVER SO PATIENTLY by my 11-year-old) was done in Lion Brand Homespun (Ebony and Granite) with a sc/dc tradeoff type pattern. When I only did one row of grey in the middle (instead of two like I did on the two sides), it made a lovely dot pattern, as you can see. This of course got me thinking about Morse Code, and I looked it up… dash-dot-dash is the Morse Code for the letter “k”. This scarf is for my friend Kelly, so ya see it’s now personalized! 🙂 I love it and I absolutely LOVE the story! Ooh it looks so warm and snuggly. I love homespun!